Editor’s note: Judi Wills of Alliance was featured in this newspaper’s nine-part series, which examined the huge increase in wireless radiation, and its possible negative health effects. Here, she expresses concern over Smart Meters soon to be installed throughout the service area of Duke Energy Progress. 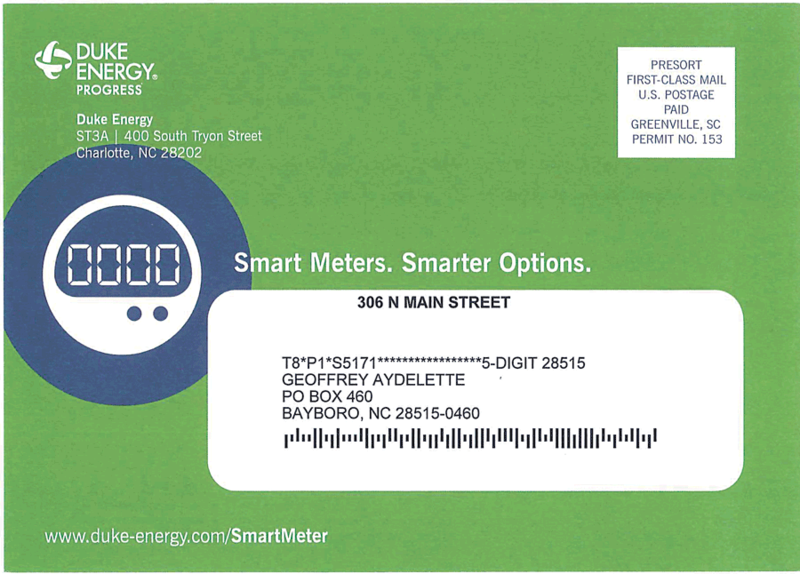 NORTH CAROLINA – This letter is a follow-up regarding a series of articles you published a few months ago regarding Duke Energy and the Smart Meters. I recently received a notice from Duke Energy stating that installation of the meters will begin in a few weeks in our area. If I remember correctly, in one of your articles on the subject, it was mentioned that Duke was contemplating asking the North Carolina Utilities Commission for permission to charge customers $250 to opt out of the Smart Meter Program. The notice I received did not mention anything about opting out, it merely stated how wonderful your life will be with the Smart Meter. I am severely sensitive to the electromagnetic field so it is imperative that I not have the meter installed. Since there was nothing mentioned regarding opting out of the program on the notice, I called the number on the notice and was told that they have nothing to do with opting out. The Opt Out Program is not scheduled until next year, at which time consumers will be sent a notice about the Opt Out Program. This, of course, is well after the meters will have already been installed. Currently, there is no list being set up allowing consumers to opt out. I asked how I could go about not even having the meter installed in the first place. The person I spoke with said she would contact the installation contractor asking them not to install the meter at our address. Since she had difficulty even finding my account (after sending bills for years! ), I can only hope she was successful in following through with what she said she would do. This is what I am suspicious of: Duke is spending a lot of money to install these meters, whether the consumer wants it or not! Then, the utility is going to contact the consumers to let them know there is an Opt Out Program? Seems quite backward to me! Being weary of big corporations like Duke Energy Progress, I wonder if consumers who want to opt out will then have to pay to have the meter removed? If your readers are contemplating opting out of this program, I’m hoping they will be proactive about not having the meter installed in the first place. Perhaps if the word gets around all the areas affected, people can protect themselves ahead of time. Thanks for the call. Here are some links below and info on smart meter bypass/opt out. I would reiterate that smart meters offer many benefits to customers including daily, hourly and average usage information available before the bill arrives, so customers can make smart choices to manage their energy use and their bill. Also, smart meters help improve outage detection and response, which can speed the process of restoring remaining outages after a major storm. And smart meters can help provide an improved level of service to customers by enabling features such as usage alerts, choose your own due date, and remote start/stop of service. And we will be exploring more features in the future that this improved technology enables. It’s also important to note that smart meters are safe and used as a standard technology for utilities across the nation. Smart meters also use the same frequency that your current digital meter uses, and has used for many years. And we only transmit your usage data and meter ID (no other personal information), and do so over a highly secure data network to prepare your bill and provide you with intelligent data about your energy use when you view your account. Duke Energy Progress smart meter info: www.duke-energy.com/smart-meter (customers might have to select their location so the website can provide regional-specific information). You will note a question in the frequently asked questions relating to what to do if you don’t want a meter. Of course, we encourage customers to first take the time to read the information provided to see if addresses their questions/concerns before requesting their meter not be installed. Mr. Brooks of Duke Energy also stressed that while opt-out procedures have been formally approved in territory served by Duke Energy Carolinas (western part of North Carolina), the issue is pending in territory served by Duke Energy Progress (which includes all of Pamlico County and other eastern North Carolina counties.) The North Carolina Utilities Commission is expected to rule on the matter early next year. Duke Energy Carolinas customers in North Carolina may elect to have a smart meter with the radio feature disabled so that it does not transmit radio-frequency signals or usage data when they enroll in our Manually Read Meter (MRM Rider). This program allows customers in North Carolina to have their energy meter manually read. Please note by enrolling in the Manually Read Meter program, the following charges will be added to your Duke Energy bill. The initial setup fee can be paid in installments over 6 months. The fees can be waived altogether through a medical fee waiver process. Duke Energy Progress filed a proposed opt-out option with the N.C. Utilities Commission on Oct. 3, 2018. That proposal is currently under review by regulators. At this time, customers who do not wish to have a smart meter installed on their premises may request to be added to a bypass list by calling 800.554.3297. While on the bypass list, Duke Energy will work with customers to address any questions or concerns they may have about smart meters and the installation process. When an official opt-out option is available, we will attempt to contact any customers on the bypass list to make them aware of the opt-out process. We do not have an estimated time at this point when the proposed opt-out option will be available, but remain committed to working with customers to address questions they may have about this innovative technology. And, important to note, out of more than 2 million smart meters deployed across the state so far, only a fraction of one percent of customers have expressed concerns that elevated to a bypass or opt-out being requested.